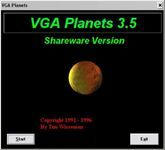 VGA Planets 3 is a turn-based, multiplayer PbeM game for the PC, produced by Tim Wisseman. It's a typical 4X game (eXplore, eXpand, eXploit & eXterminate) : the players all start with either 1 spaceship in space, or one planet, or a small empire, depending on the chosen start scenario. The whole 2 dimensional map is visible, but players have to fly to other planets to see what kind and quantities of raw materials and what sort of climate it has (explore). Also, other players are only visible for as far as they fly in open space within visual distance. Players quickly claim nearby planets (expand) and start mining for minerals, needed to fuel their fleet and build new ships (exploit). Players can build unarmed freighters but also a war fleet, needed to attack their fellow players (exterminate). A standard game has no victory condition besides what the players agree upon. Which can vary from "till one player is eliminated" and "till one player owns half of the 500 available ships" to "last man standing". The base game has 1 fixed map and no option for AI, but mods for variable maps and computer opponents are available as community build freeware. Being an older game, the 'VGA Planets 3 universe' always consisted of 500 planets and also 500 ships (in total), making destroying enemy ships to expand one's own share in those 500 a bojective in it's own. Also, fleet combat was fought in a 1-on-1 scale, so enemies would sort of 'line up' and fighting sequentially, ships fighting on till blown away and taking their damage to the next battle. VGA Planets 3 was, obviously, preceded by VGA Planets 1 and 2. But this game became far more well known and, eventually, played all over the world. It was available as shareware version, which allowed players to play the whole game, but not make use of all the better technologies: technology was divided in hull designs, lasers, torpedos and engines, all 4 ranging on a scale from 1 to 10. Player could invest in research, upping their tech levels, so with better engines they could fly faster and more fuel economical. Tech levels 1-6 were available for shareware, 7-10 was unlocked in the registered version. Upon sending Tim Wisseman the money, he would mail the 3.5" floppys with the reg.version back. The modern browser version, active since 2010, can be found at Planets Nu.